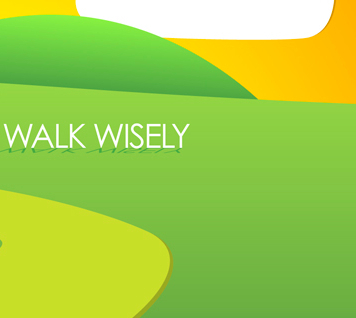 Walking wisely is about working through life's situations and decisions according to the guidance we've been given. But there usually isn't a one-to-one correspondence between the guidance given and the decision to be made, so we practice discernment as the ancient admonitions meet new circumstances. Discernment is a key word for us because it denotes the process of testing, weighing, sorting, and judging. It reminds us that all the strategies available for moving forward aren't equal: some are better than others, and some are more faithful than others. Scot McKnight, a New Testament scholar, recognizes the necessity of discernment when he says, "It would be much easier for God to have given us rules and regulations for everything. But God, in his wisdom, has chosen not to do that. Discernment is an element of what it means to walk by faith". We attend schools, go places with friends, talk with acquaintances, and possibly even live with families where multiple opportunities and options are offered to leave behind our sacred heritage as we get on with our lives. "Go your own way, be your own person," they insist, all the while failing to realize that their own advice is embedded in a heritage of imagined autonomy that assumes people can make up their own story as if they didn't already have one . Beyond that, the sheer amount of information available to us is more than any society in the history of the world. And with that amount of information comes various opinions on what to do with all of it. That's why discernment is necessary. So we instinctively rely on trusted interpreters like parents, friends, teachers, reporters, journalists, coaches, pastors, and elected officials to help us discern what is good and bad, true and false, worth doing and not worth doing. In the New Testament, the Apostle Paul counsels the church to practice discernment. He says, "Let two or three prophets speak, and let the others weigh what is said" (1 Corinthians 14:29 ESV). The prophet is one who offers a prophecy, an interpretation of God's action in the world with a call for the proper responsive action. But not all prophecies are equal, so discernment is required. Elsewhere Paul says, "Do not despise prophecies, but test everything; hold fast to what is good" (1 Thessalonians 5:20-21 ESV). He is insisting that every interpretation of reality and subsequent call to action should be tested, weighed, sorted, and judged. Some will be found worthy of attention and assimilation, others will be found unworthy. Generosity is better than greed. Humility is better than pride. Honesty is better than deceit. Fellowship is better than isolation. Worship is better than idolatry. Scot McKnight, The Blue Parakeet, 133.